Simple in design, and simple to use. The 90° Router Bit Wrench makes a difficult router bit change easier with it's "bent wrench" design. The wrench bends right around the opening of your router plate so you can easily secure the nut below your bit on your router. The handle is is coated with a solid rubber for a nice easy grip. The Stone Mountain Offset Rotter Collet Wrench makes changing the router bits on a table mounted router much easier. 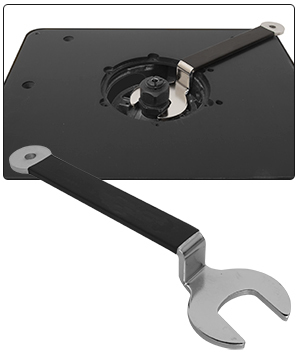 The unique bent wrench design allows you to place the wrench right on the collet where it needs to be without having to reach underneath the table top. The wrench is made from Heavy Duty Plated Steel for durability. 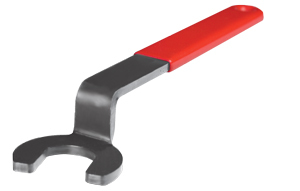 The handle is fitted with a comfortable grip and has a convenient hanging hole on the wrench for storage.